My Review:I was happy to return to this fantasy world. I decided I wanted a book I would be sure I would enjoy after I just DNF the previous book I attempted to read. And returning to this series was a great decision. I quickly got sucked back into the story and I really enjoyed this book from start to ending. Book 2 ended on a bit of a cliffhanger and in this book we get to see what happens next. I wasn’t sure what I had expected to happen next after the ending of book 2, but this wasn’t it. It was really interesting reading how things progressed and especially how Olina handled it all. She has changed and grown so much in this series and this book is another very important step in her character development. She embraces her role as future ruler a bit it seems, she takes responsibility and makes some big decisions. There is also a decision she makes and I enjoyed seeing how she handled it and how everyone reacted to the news. I also liked how in this book we get to see more of the side characters from previous books. And it feels like almost everyone has a role here, which was great. I enjoyed seeing more of the side characters again and how they were doing. This author writes such a great cast of side characters! I also was happy to see more of Olandon in this book and there are some important changes in his character as well, which I enjoyed seeing. There are some side plot lines that come to a conclusion in this book and some other plot lines that continue and even some new ones that are started. While the book might feel a bit gentle paced at times, which totally works here, there is a lot going on. Olina goes through some amazing character development in this series and I think I say this in every review for this series so far. But so far in every book she has changed as a person and every book presents her with new challenges and decisions and she continues to change. It really is amazing to see and she really grows into her own as the series progresses and every time I think she has found her place there is more to happen. There were a few things I wasn’t 100% sure about that she did, but I liked reading how it all played out and in some cases she might not go about things the right way, but I could see why she went this route and in the end I am glad she did what she did. There also was a bit of romance in this book and while at first I wasn’t as sure about it, I am totally rooting for this couple now. Although this book did have some moment where I wanted to push their heads together and have them kiss instead of the half misunderstandings and avoidance and trying to do the right thing. I get why they acted that way, but at the same time I just want them to be together. But there were some great scenes that totally made up for the slightly frustrating ones. And by the end, I just hope they keep following this trend in this next book. They still have some things to work through together and I hope to see some of that in the next book. 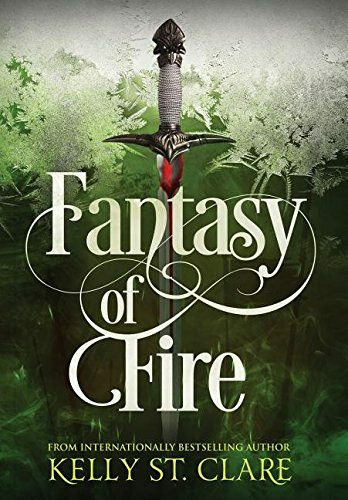 To summarize: Fantasy of Fire is a great third book in this amazing fantasy series. I easily got sucked back into the story and I really enjoyed this book. There are some interesting plot developments in this book. There are also some side plot lines that got resolved, others that continue and some new ones that pop up. I wasn’t sure what I had expected to happen in this book, but I am sure it wasn’t this. The book had some great twists and surprises. One of my favorite parts is seeing how Olina develops over the course of the series, it’s awesome to see how she changes in each book. There are new challenges and decisions she has to make in this book and I enjoyed reading how she handled it all. There is a bit of romance as well, by now I am fully invested in this couple and while there are some frustrating scenes there are also some beautiful and touching ones. I am looking forward to see how book 4 wraps this series up! What’s the last fantasy book you read? I don’t think I’ve read a fantasy in a long time. Glad to hear you liked this one. I read a few fantasy books this year. This series is really good! I am not a fantasy of this type reader but can appreciate that lots of people love them. I do like that the heroine grows so much during the series and that there’s a lot going on. I hope book 4 is just as good for you! I don’t pick up a lot of fantasy books like this, but I am glad I picked this one up :). It’s great to see how much the heroine has changed throughout the series! It does all make sense when you read the book :). But yeah it’s a bit awkward indeed. Glad this one cleansed your palette after the other one disappointed. I like that there is still good character development going on and that the book’s direction surprised you after the cliffhanger. I am reading a fantasy right now, Mark Lawrence’s Red Sister. I’m only at the beginning, but its starting out good. I notice fantasy usually takes a while to really get going and I don’t mind. Sometimes you just need a book you know you will enjoy after a disappointing read. I really like this series and the character development is great! I agree fantasy sometimes takes a while to get going and that’s okay :). I hope Red Sister turned out to be a good read for you! They sure got on my nerves a few times, but as the romance is only a side plot line and they are in a bit of a tough situation I kept my patience. It’s always great when a book exceeds your expectations! It’s nice sometimes when side characters get a bit of a spotlight, esp when authors are so good at writing them! And the character development for Olina sounds great. And you may have been frustrated by the characters in the romance, but I think that’s a good sign that the romance and chemistry was written well if you wanted them to get together so badly! This author is so good at writing side characters, it’s fun to read about them all. Definitely, the romance and the chemistry was well done, even though I just wanted them to get together already. Olina has some great character development throughout this series.